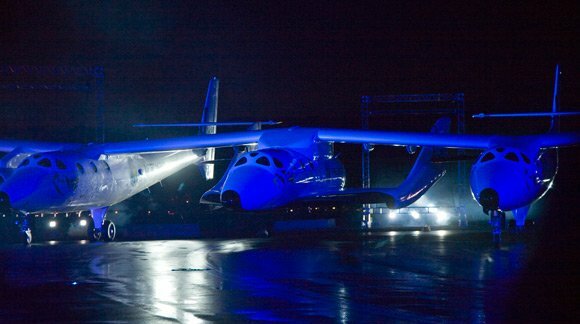 Virgin Galactic yesterday unveiled its SpaceShipTwo (SS2) passenger-carrying rocketplane in a lavish* ceremony at New Mexico's "Spaceport America". SS2 rolled out slung under the WhiteKnightTwo mothership, which will eventually carry it aloft to 50,000ft before the pair part company and a hybrid rocket engine blasts six SS2 passengers and two astronaut pilots on their sub-orbital joyride. Governator Arnold Schwarzenegger was on hand to christen SS2 the "Virgin Space Ship (VSS) Enterprise" - something which is "not only an acknowledgement to that name’s honorable past but also looks to the future of the role of private enterprise in the development of the exploration, industrialisation and human habitation of space". Before Branson sets about conquering the galaxy, SS2 will have to earn its "all required US government licensing" wings. Virgin Galactic says the design will be "refined and completed during an extensive test flying program to commence shortly". 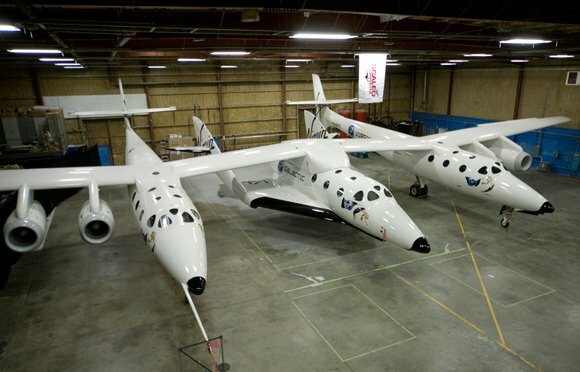 Scaled Composites, which constructs both the SS2 and WhiteKnightTwo vehicles, will doubtless be hoping the former behaves itself during testing. The WhiteKnightTwo, aka VMS (Virgin Mothership) Eve, suffered a tail strike during a touch-and-go manoeuvre earliert this year, which prompted much press speculation about control issues.